Writing While Black is a creative writing series centred around the voices of writers from the African Diaspora. These workshops are tailored to black writers at all stages of their writing journey (beginner, emerging, mid-career, established) writing in any genre or discipline (fiction, non-fiction, poetry, journalism, dramatic writing, spoken word etc.) The main goal of the workshops is to create a safe space and develop a community of black writers who can provide support to one another's artistic projects. So I'm asking for support for y'all. Writing While Black is entirely people-powered and receives no government grants but relies on the love and support of the community to keep it flowing. If you are about support grassroots community building, be a patron. I swear, only good things will come of it. We're super grateful for any and all donations (big or small). To even share and spread the word is also appreciated! If you are interested in donating money, time, energy and love notes, message us to support. 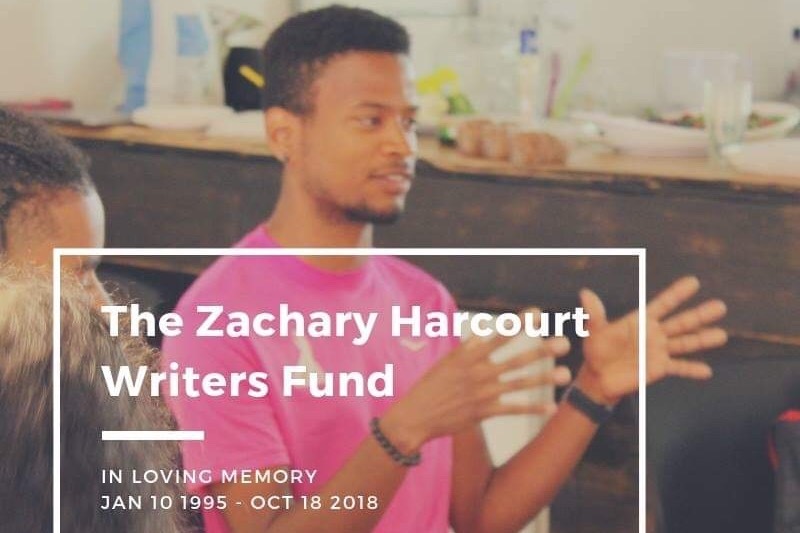 From now til January 9th all Writing While Black donations will be in support of the Zachary Harcourt Writers Fund. So instead of me simply telling you why you should support Writing While Black, let these lovely writers who have both been involved with WWB for some time tell you the story! Krystal + Liz support WWB too! Love and respect to everyone who has supported the Writing While Black movement. Everyday I log in and I am surprised and humbled to see another beautiful soul who is on this journey with me. This video right here is talking about the small way I can give back to y'all...through our prizes. We'll be giving away a fresh-new zine called...(surprise, surprise) Writing While Black. As well as personalized poems by yours truly, WWB workshop coupons, photography services, tote bags, notebooks and an extra special shout out. So we're a full week into the fundraising and I have been flat out grateful to all the folks who have contributed so far. Here's the lastest video update with me and fellow black writer discussing WHY it's so important to support WWB and so many other black run initiatives. hope the campaign goes well! Thank you for contribution. 'Their Eyes Were Watching God' and we're watching you being gracious. We'll return the favour and print your name in our zine. Our dream will not be deferred. With your help, it's one step closer. Thank you for your love. We'll print your name in the zine and issue you a free e-copy. You coloured us Purple with you loving gift. Thank you. We acknowledge you and will mail you a physical copy of our upcoming zine. Just when we thought that 'Things Fall Apart', you've swooped in to support us. Thank you. We honour you with a copy of the zine and a personalized poem. We are no longer 'Caged Birds. We are free thanks to your donation. We'll be sending you a copy of the zine, a personalized poem + a free coupon to any WWB! 'Go Tell It On the Mountain' that you are incredibly gracious. You will receive a personalized video from the WWB team yelling your name from a mountain! We no longer feel like a 'Sister Outsider' with this incredible donation. We grant you unlimited access to any and all Writing While Black sessions. No expiry! You are more than just family. You are 'Kindred'. You will receive all the gifts but also make decisions on the future of WWB and we try to manifest it! You are among the 'Beloved' in our hearts. The voices of our grandchildren echo our gratitudes. What else is more rewarding than that? Donation in honour of Zach Harcourt (January 10, 1995- October 18, 2018) Life is short and still, shorter for others. Another light missing but shining brightly upon us.